^^Few pastors or Christian writers have dared to approach the subject of how proper eating and an active lifestyle can affect how we serve God. Author Gary Thomas does just that. And he reaches all the way back to the apostle Paul, who wrote that we need to prime our bodies to become, "an instrument for noble purposes, made holy, useful to the Master and prepared to do any good work." ^ ^To illustrate the body/soul correlation, Thomas presents engaging and diverse stories that include a young mom who got fit through volleyball and reaped spiritual rewards in her marriage, a 300-pound pastor who realized his obesity was eroding his ministry impact, and a woman who gained the spiritual strength to survive a contentious divorce by training for a marathon. In every instance, Thomas makes a direct connection between the physical challenge and its spiritual consequence. ^ ^This book is a must read for anyone seeking new and compelling motivation for strengthening their bodies and fortifying their souls. 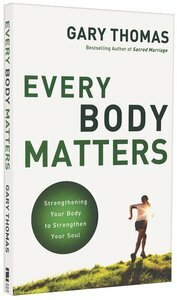 Customer Reviews For "Every Body Matters"
This was a loaner from a friend, but I'm going to buy my own copy! This book is such a timely message for myself, but I would say to everyone struggling with weight. I found myself almost on every page and will be referring back to this for more thoughtful reading. I like that it was written by a man actually, and not a woman. But he's not condescending or anything. Gary Thomas's writing is real and thought-provoking. He touches on areas that the church doesn't so much address anymore and are maybe not so PC, but they are pertinent to "every body" in this day in age especially. I plan on taking this book and applying it to my life and using it as an encouragement to myself and to others. I highly recommend this book.